Unmanned aerial vehicles (UAVs) or drones can be used to monitor electricity transmission lines. This was the conclusion of trials conducted recently by Terra Drone Indonesia and Japan's Central Research Institute of Electric Power Industry (CRIEPI). The demo was conducted using Terra Wing drone at PT PLN (Persero) main transmission unit (UIT) in East Java and Bali (JBTB). The drone was able to monitor two kilometers of electricity lines covering four transmission towers in 10 minutes. The demo has also proven that drone technology can be used to safely carry out mapping and monitoring in high-risk areas such as energy and utilities. Terra Drone Corporation, headquartered in Tokyo, is a provider of industrial drone solutions with 20 branches globally, including the Asia-Pacific. The company provides drone technologies empowered with LiDAR and photogrammetric surveying methods for construction, electricity, energy, and oil and gas sectors. It specializes in high-performance hardware, software, drone services, and drone traffic management systems (UTM). Terra Wing, the drone used for the PTN trials, is a fixed-wing drone developed especially for topographic survey purposes in sectors like infrastructure, mining, agriculture, and utilities. Data obtained from drone monitoring are in the form of a point cloud or 3D model of the power line, derived using a software system developed jointly by Terra Drone and CRIEPI, the company said. “This data can be analyzed to understand the distance between cables and to identify parts that have started to become loose. The data also acts as an efficient vegetation management solution because potentially disruptive foliage surrounding the power lines can be easily identified in great detail and with high accuracy using drones,” it added. In January 2019, Terra Drone has invested in AeroGeosurvey Indonesia to form Terra Drone Indonesia. Established in 2016, AeroGeosurvey provides solutions for industrial application, including aerial mapping and modeling, as well as aerial inspection and monitoring. 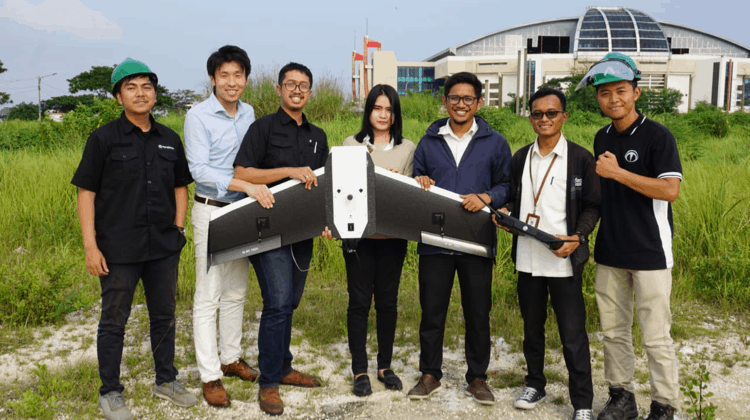 With Terra Drone technology coming into the company, Terra Drone Indonesia is envisioned to be able more drone applications in other Indonesian industries. Michael Wishnu Wardana, Director of AeroGeosurvey, said in a media statement at the time that with Terra Drone’s investment in the company, they will be able to provide a higher level of service by utilizing, for example, the company’s 3D surveying know-how and the LiDAR system Terra LiDAR. The terms of the investment were not disclosed.